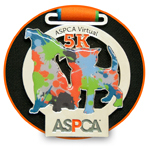 This June, I will be participating in the ASPCA Virtual 5K! I am excited to be participating and to be raising the awareness and funding to support the ASPCA's programs. Please support me by making a donation and help me make a positive impact in the lives of animals! Ya'll know how important animals are in my life, and how I truly believe that even the littlest bit helps. I don't care if it's pennies or tenners, do it for the doggos! Daphne and Rose Red thank you all for the support.